Films about the Iraq war have won awards but not big audiences. Now with a new one starring Matt Damon just arrived, there are three in theatres, each with a different angle on the war. There’s competition, though, from a pack of movies about teens, young love and families in turmoil. Good on Paul Greengrass. He’s applied his high-energy Jason Bourne movies style to a bigger purpose in this passionate and angry look at the Iraq war. He shows how the Americans’ lied about weapons of mass destruction, makes George Bush look ridiculous by replaying his famous “we have prevailed” announcement and follows it immediately with the huge mistake by his main man on the ground that triggered the insurgency and factional fighting. All this comes in an exciting action movie. 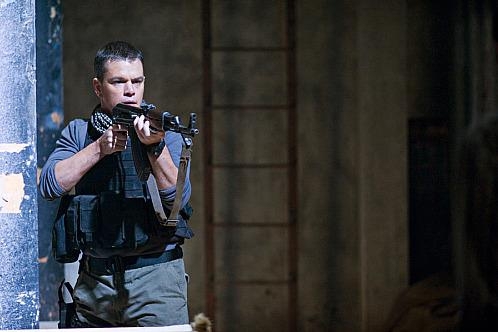 Matt Damon plays a soldier hunting for those weapons but encountering only doubts. When every sure-thing lead turns up empty, he dares to ask who is providing the faulty “intel?” He’s told to just keep quiet and do his job. Of course he doesn’t. What he eventually finds pretty well blows the rationale for the war to bits and exposes both incompetence and infighting among the occupiers. Much of this has been told before in documentaries and may now get to a wider audience in this thriller format. It’s not perfect. With so much political content, the film is short on emotional connection. Also you already have to know the story to get some of the details, a politician, for instance, clearly based on Ahmed Chalabi the Iraqi who lured the Americans into the war and was active again just last week during the elections. Or the woman New York Times reporter portrayed here (for legal reasons) as a Wall Street Journal scribe. Greg Kinnear as an unctuous U.S. man in charge and Brendan Gleeson as a disapproving C.I.A. operative are in the strong cast alongside a fine group of middle-eastern actors. The big winner at the Academy Awards is back again at a couple of theatres. This one is practically apolitical about the Iraq war. It doesn’t delve into the reasons, the right or wrong that people have to study to be able to debate. It traffics in breathless suspense watching closely as a group of U.S. soldiers search out and dismantle bombs. In scene after scene, one man goes out to disarm a device, never knowing whether there’s a timer ticking down or a guy nearby wielding a remote to set it off. It’s fiction but feels absolutely authentic. The writer spent time embedded with squads like this. Instead of debating this war, the film focuses on one lead character, played by Jeremy Renner as an adrenaline junkie. For some, of course, that’s the thrill and the attraction of war itself. Kathryn Bigelow won an Oscar for her directing and Ralph Fiennes, David Morse and Guy Pearce show up in small roles. Filmed in Jordan, and (a few later scenes) in Vancouver. I finally caught up to this one because it’s also Iraq-related. And because it’s very good. Robert Harris must really hate Tony Blair. He’s a former reporter in England who used to support the former Prime Minister and later turned against him over the war. He wrote a scathing novel and then this script. Pierce Brosnan plays an ex-PM much like Blair, holed up in a beach house in Massachusetts and recounting stories for his memoirs. Ewan McGregor plays the writer hired to fashion them into a book. Like his predecessor who died mysteriously, he’s soon tracking down some dangerous hidden information. Roman Polanski directs us smoothly along a twisting story line of intrigue and political misconduct. This is an intellectual thriller, a bit too slow and not as gripping as the better Hitchcock films but certainly in that league. Last year we got An Education, a nifty little film about a teenage girl learning some hard lessons growing up in England. Now, step down the class system a few rungs and enjoy this somewhat similar tale set in a public housing project, or council flat, not far from London.